Staff Sgt. Kyle Emmel, a 17th Training Group student, is an avid cyclist who rides to stay in shape both physically and mentally. Emmel said he had to build cycling into his life, which became a pivotal component in helping with depression. GOODFELLOW AIR FORCE BASE, Texas (AFNS) — His mind goes blank. All that exists is the terrain around him and the two wheels spinning below him — that is, until his body stops sweating completely. Emmel, now a 17th Training Group student, was almost halfway through an 80-mile gravel race when he realized he had missed each of the posted water stops. Desperate for fluids, he pulled over to a local ranch. “I found a farm yard with a couple of guys drinking beer at their barn and I pulled in and asked them for water,” he recalled. The thirst-quenched cyclist then mounted his bike and peddled to the end of the race. Emmel wasn’t always an avid cyclist. It was October 2006 when Emmel became a Soldier for the North Dakota National Guard and trained in stinger-missile air defense. In February 2008, he volunteered for a deployment to Afghanistan where he monitored the surrounding area from a tower with an infrared sensor. The young Soldier spent a year at the forward operating base. Coming home wasn’t easy for Emmel. He would find himself getting frustrated at people who would complain about their problems, when all he could think about were the issues in Afghanistan. “You’d hear people talk about how their TV shows aren’t on or that the mall is closed this weekend and I was just angry at everybody because their problems, to me, were frivolous,” he said. Emmel said that his frustration lasted for about two years until he committed himself to his college courses, which distracted him from everything that was going on in his mind. 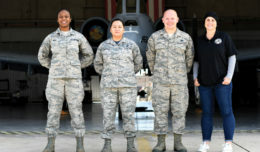 After college, he took on another deployment — this time to Washington, D.C.
“My unit deployed as the air defense for Washington, and I realized that I could take everything I learned from my first deployment and teach it to the other Soldiers,” he said. Emmel began helping Soldiers with their finances, jobs, family life and anything that they struggled with during their first deployment to D.C. He said that helping his fellow Soldiers helped him with his frustrations. Toward the end of his deployment, things were looking up for Emmel — or so he thought. Within two months’ time, Emmel said he began questioning his part in Afghanistan again. “I didn’t do enough. I failed. I should go back,” he said. Emmel fell into a rapid decline. While driving one day, Emmel had a thought he never expected to emerge. “I’d pick out the pillar on the freeway and thought, ‘all I have to do is hit that pillar with no seat belt and this would all be done,’” he said. After talking to the chaplain and his wife, Emmel decided that the only way he could get over the depression was to take it on himself. Emmel would make sure that his bike and equipment were easily accessible for him so that all he had to do was hop in his car and go mountain biking. He began riding more and more. Between going on tours and participating in races, biking became paramount in his life. After his accomplishment, Emmel set an even bigger goal. Emmel has trained for the past year and will continue to train for the coast-to-coast race. In the midst of it all, he transferred from Army to Air National Guard and is currently cross training career fields. 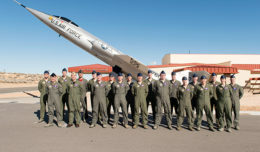 He is now at Goodfellow Air Force Base for technical training. 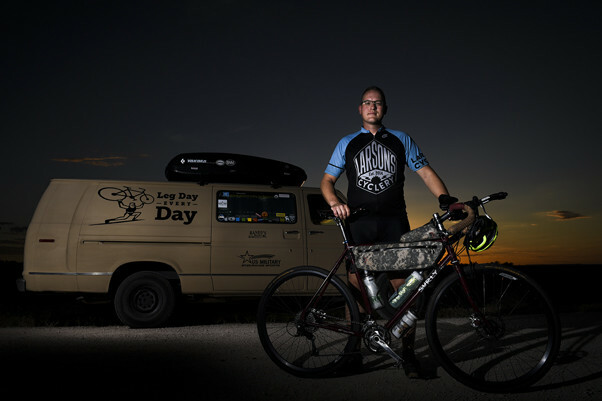 “A lot of my fellow Soldiers would lift weights, and they would all make fun of me for just riding bikes,” he said.